If the average person supposedly sees ~5,000 advertising messages a day, I’m positive lawyers see 20,000. There is always a new legal directory that “drives more clients than any other legal directory” or SEO’s promising #1 ranking for the search term, “attorney” in your respective geographical market. What follows is the backlink analysis methodology we employ to evaluate the benefit (or harm) resulting from listing our clients on a specific directory. It’s pretty simple and uses free tools…. so you can emulate our approach the next time tomorrow when you get hit with an email from a new legal directory. High end legal directories are great sources of prospective clients, citations (a critical factor in local SEO) and occasionally links (a critical factor in local and organic SEO). Avvo, Justia, HG and (ahem) even FindLaw are the most obvious; but there are plenty of smaller effective ones as well. We happen to like the guys over at LawDeeDa and practice area specific sites like DUI.com. But not all directories are created equal – and a backlink profile relying heavily on low end, low quality, spammy directories is Penguin Penalty fodder. But how do you separate the directory wheat from the chaff pending Google penalty. I’ll now walk you through my evaluation of Best Biz Local as a potential citation/link opportunity. You can follow these steps in the future when promising directories and link opportunities come across your inbox. 20/100 actually isn’t as bad; a 20 is on par with what we see for the average law firm website. It’s low for a directory, but not terrible. This would not turn me away from using this directory. Again, this is assuming I didn’t see their link scheme right off the bat. Step 3: Does Google trust this site? If this website asked to borrow your phone on the street would you let them, or would you pull the “sorry it’s dead…” card? The go-to tool to determine a website’s trust flow is called Majestic. You can use Majestic’s Site Explorer feature with no SEO expertise. If you are have a link or are considering obtaining a link from a website like Best Biz Local, you want the trust flow number to be as far from 0 as possible. Bestbizlocal.com’s score is 3. For reference, the average we generally see on law firm websites is in the teens. A major directory with such a low score is very concerning to me. If you look more closely at the picture you’ll see why the trust flow is so low — this site has nearly 150,000 external backlinks from only 6 referring domains. Those 6 sites are linking to bestbizlocal.com A LOT. There is no way to “naturally” link to another site thousands of times like that, so that was red flag number 2 for me. And its safe to assume that a)this site doesn’t get any natural traffic and b)given their own spammy backlink profile, any links or citations on the site are, at best not going to help. Sites relying heavily on these types of directories are heavily at risk of a Penguin penalty. Now, this is not the perfect evaluation method for a potential directory/link opportunity. Sometimes you know right off the bat the linkexchangeforfree.com (disclaimer: made up website) is not a good website to obtain links from. Smaller directories, especially local directories, rarely have a plethora of links themselves, but (done well) they also won’t have either the reciprocal link requirement or a litany of links from a tiny subset of domains. If you are presented with a new legal directory, or any sort of link opportunity, first take a deep breath and then take 10 minutes to follow these 3 steps to evaluate if it’s worth it or going to hurt you. Check out the process for a listing submission. Are you required to link back to their site? Are you required to pay a monthly fee for the link? If you see anything that directly violates these guidelines, take heed. Determine the website’s domain authority with Moz’s Open Site Explorer. Higher is better, but low is not always bad. 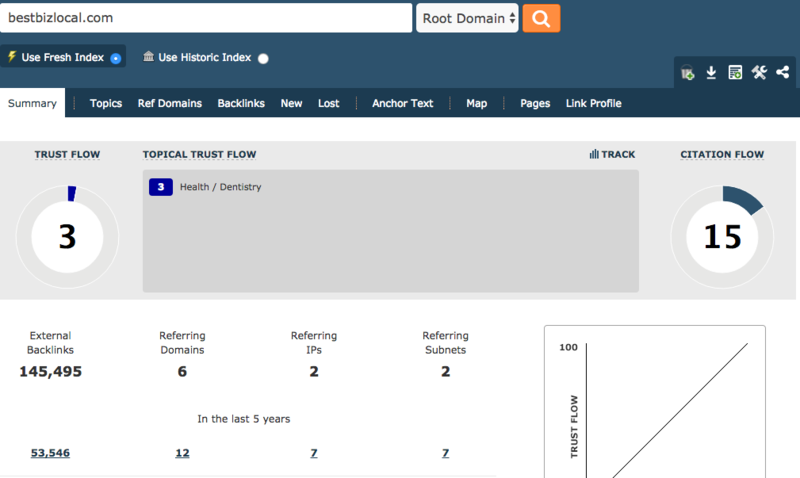 Find out the trust flow score with Majestic. Be careful with anything under a 5/100. If Majestic doesn’t trust the site, you probably shouldn’t either. If you are curious about any particular legal directory you’ve seen lately, or would like my help evaluating a site before you submit a listing, shoot me an email (dustin at mockingbirdmarketing dot com) and we can chat!